During the weekend of the Rev. 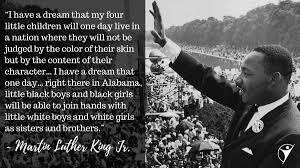 Martin Luther King Jr. holiday, I reflect upon King’s dream of "sitting down together at the table of brotherhood." And why not? We are all created in God's image. St. Paul, in his letter to the Christian community at Corinth, notes the many gifts we have for the common good, for building up community. Yes, people working together can accomplish so much. An airplane involves teamwork. So does our Catholic community. And our legislators might benefit from St. Paul’s advice to seek the common good in their deliberations. In the Gospel according to John, the first sign Jesus worked was in the town of Cana in the region of Galilee. There are different levels of meaning in this story. On one level, Jesus, his mother, and the disciples have simply been invited to a local wedding. Mary, in some ways, could be a wedding planner. On another level, Mary appears as our mediator, interceding with her Son on our behalf. On a third level, the water made wine symbolizes the breaking in of the kingdom of God—the symbolic wedding banquet at the end of time. And on a fourth level, this first sign is one of seven in which the author points to Jesus as “the revelation” of God to us. Yes, there can be many levels of meaning in scripture. In light of the wedding at Cana, I would like to reflect briefly upon the sacrament of marriage. Often people are looking for the perfect this or that and forget that life is not perfect. I doubt there’s such a thing as the “perfect” marriage. Marriage is a work in progress. ; we're a work in progress. Marriages can be described in three stages: first the honeymoon; then disillusionment; and then the initial partnership can either break up or become true love. Their relationship can become a covenant where they live for each other, for God, and for others (e.g., their children). And that is true love. True love can emerge only if we forgive, work out compromises, disagree without being disagreeable, compliment each other regularly, accentuate the good, clarify our essential core values, accept differences (our way isn’t the only way), and communicate regularly. Don’t let children eclipse our primary vocation to love one another. Try to find balance, between work, family, and personal time. When sorting through an argument, always distinguish between behavior and negative judgments about that behavior—for example, you’re late for the birthday party (behavior) versus you’re the most inconsiderate person I know (negative judgment). Name-calling will not bring us closer. As with most things in life, we continually must work at good relationships—sticking together in tough times and with confidence that times will get better and we’ll reemerge closer. The wedding of Cana invites not only husbands and wives but all of us to reflect upon our relationships with one another. How can we cherish and support and re-energize that? Above all, make room for God.